Discussions of how to simulate early in product development fixate too often on FEA, overlooking the power of systems modeling and 0D/1D simulation for studying, exploring and optimizing designs at the beginning of projects, when product geometry is seldom available for 3D CAE but engineering decision-making can have its greatest impact and leverage on project success. Systems modeling software consists of tools and languages for systems engineering: the specification, analysis, design, verification and validation of systems and systems-of-systems. In discrete manufacturing, systems engineering is the coordinated specification-through-validation of complex physical systems across multiple domains—mechanical, electrical, electronic, hydraulic, thermal, control, electric power, others. 0D/1D simulation uses the time dimension only (0D), or time plus a single spatial dimension (1D), to model and evaluate critical aspects of a system’s behavior. By contrast, 3D CAE takes account of a model’s behavior in all three spatial dimensions (or 2D for cases such as plate structures and others where the third dimension can safely be neglected). Together, systems modeling and 0D/1D simulation are used early in engineering projects to make a product’s crucial functional and architectural decisions. An encouraging trend of technology integration between design exploration and optimization software and systems modeling and 0D/1D simulation tools promises significant benefits for systems engineering professionals in their high-value, high-leverage role of innovating and optimizing designs at the product architecture level. Red Cedar Technology and Ricardo Software partnered to embed Red Cedar Technology’s design space exploration technology into IGNITE, Ricardo’s physics-based toolset for vehicle and powertrain system modeling and simulation. Every copy of IGNITE now includes the Red Cedar Technology capabilities to let engineers quickly identify design variables and constraints, select quantities to minimize or maximize, and easily find optimal designs and design sensitivities. Red Cedar Technology and Comet Solutions partnered to integrate HEEDS MDO with the Comet Performance Engineering Workspace. Red Cedar Technology president and CEO Bob Ryan explained, “Outstanding progress has been made to date in leveraging detailed CAE models to reduce hardware prototypes and verify design performance before production. The next frontier is to automate the process of building virtual prototypes, allow for multifidelity models to address different disciplines, and provide efficient design optimization. This partnership is focused on making this concept a reality.” The Comet Performance Engineering Workspace leverages a proprietary Abstract Engineering Model to enable both process automation and multifidelity models. The objective of linking this with the technology in the HEEDS multidisciplinary optimization software is to let the design space of a complete CAD and CAE system model be quickly explored, and the design be efficiently optimized. DS SIMULIA’s Isight process automation and design exploration software has been integrated with a number of leading systems modeling and 0D/1D simulation tools. An Isight Dymola component creates a direct link to Dymola, allowing Isight users to specify analysis input and output parameters as well as execute Dymola, and can be used with Isight design drivers to perform Dymola optimization, DOE and Monte Carlo simulation. Dymola (Dynamic Modeling Laboratory) is a Dassault Systèmes product for modeling and simulating complex integrated systems in automotive, aerospace, robotics, process and other applications, and is available either integrated with CATIA or standalone. An Isight AVL AST component lets users integrate models from the AVL combustion engine and powertrain simulation products BOOST, CRUISE, EXCITE and FIRE into Isight process flows. The component provides access to scalar design variables and responses that have previously been defined for the respective AVL model. For each design iteration, the component transfers the current values of the design variables to the AVL product, executes the specified simulation process including all defined pre- and post-processing, and reads back the response data to Isight. An Isight Portunus component gives full, direct access to all the parameters of Portunus models for multi-domain simulation of mechatronic systems. An Isight MATLAB component enables data exchange with MATLAB. Noesis Solutions licenses its technology for optimization, DOE and robust design to Siemens’ LMS business, which embeds the software in its LMS Virtual.Lab and LMS Imagine.Lab environments for functional performance engineering. LMS Imagine.Lab Optimus is a design optimization software integration that captures and manages LMS Imagine.Lab Amesim engineering simulations, helping users quickly explore the design space for insight into possible design alternatives. It includes tools to optimize not only the design but essential aspects of the entire 1D system design process: across design, calibration and validation, system models can provide global parameter access to directly influence design decisions. Noesis offers direct interfaces to a wide range of software, and has published application notes illustrating the use of Optimus with Ricardo’s WAVE and Optimus with Gamma Technologies’ GT-POWER to optimize combustion engine performance, among others. An Optimus for MATLAB/SimuLink Interface automates the creation of Optimus simulation workflows containing MATLAB/SimuLink model entries; an embedded search engine offers dedicated filters to simplify the selection of design parameters and results components. 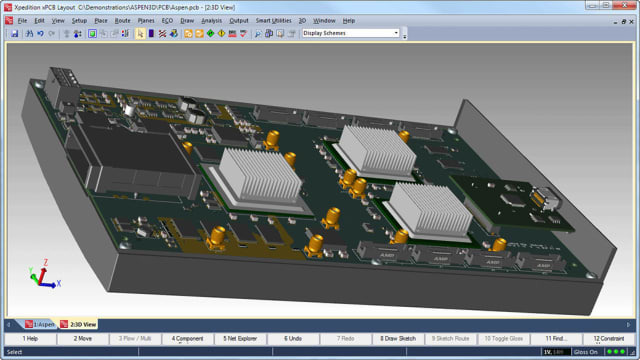 Phoenix Integration’s MBSE Pak lets users link SysML parametric models defined in Rational Rhapsody or MagicDraw with multidisciplinary analysis models developed in PHX ModelCenter. Phoenix Integration also has an integration partnership with Ternion Corporation for its FLAMES (FLexible Analysis, Modeling, and Exercise System) Simulation Framework, a family of software products that provides a framework for composable constructive simulations and interfaces between live, virtual and constructive (LVC) simulations. Phoenix Integration software interfaces with software from The MathWorks as well. For logical behavioral modeling and 0D/1D simulation, ESTECO’s modeFRONTIER provides direct integrations with MathWorks tools, Gamma Technologies GT-SUITE, Siemens LMS Imagine.Lab Amesim and LMS Virtual.Lab, ITI SimulationX, MSC Adams View, AVL AST, Flowmaster, National Instruments LabVIEW and numerous others. Integration of modeFRONTIER with dynamic simulation tools from VI-grade lets users add optimization steps into VI-grade’s HIL (hardware-in-the-loop), SIL (software-in-the-loop) and HUIL (human-in-the-loop) systems to carry out design optimization, model calibration and performance optimization. In all, ESTECO offers over 40 direct integration nodes with popular engineering solvers, as well as wizard-style tools to link modeFRONTIER with any commercial or in-house code. Altair’s HyperStudy can connect to many systems modeling and 0D/1D simulation tools including The MathWorks’ MATLAB and Simulink, Maplesoft’s MapleSim, Gamma Technologies GT-POWER, Wolfram Research software and others. The company has integration partnerships with numerous companies in its Altair Partner Alliance program, for example FLUIDON, whose DSHplus is a simulation program for dynamic nonlinear calculation of complex hydraulic and pneumatic systems and components, and can connect to HyperStudy for design exploration. In August 2014 Altair acquired VisSim, a graphical language for simulation and model-based embedded development that includes optimization capabilities. A future post will examine the role of the FMI (Functional Mock-up Interface) standard in advancing model-based design exploration and optimization. See also Challenge of multifidelity, multiphysics modeling. Update—This post was edited March 4 and April 8, 2015 to clarify and expand on the integrations offered by ESTECO and Altair.